The Everyman in the car, man. With an easy laugh and a generous hand. To catch your magnificent friends on the flying trapeze. Al always practiced this, taught this, caught this, shared this. A hero of the humble. An explorer of the quiet. A romantic of the road. A swashbuckler of the rails! 90 years of adventures into one magic trick of LIFE! We should all be so lucky! As all those who knew him were. Here’s an improvised video riff to Al full of stories and photos . . .
Or here’s The Beat Museum’s founder Jerry Cimino performing Hero of The Humble at the “non-memorial memorial wake” in San Jose on Sunday January 27th . 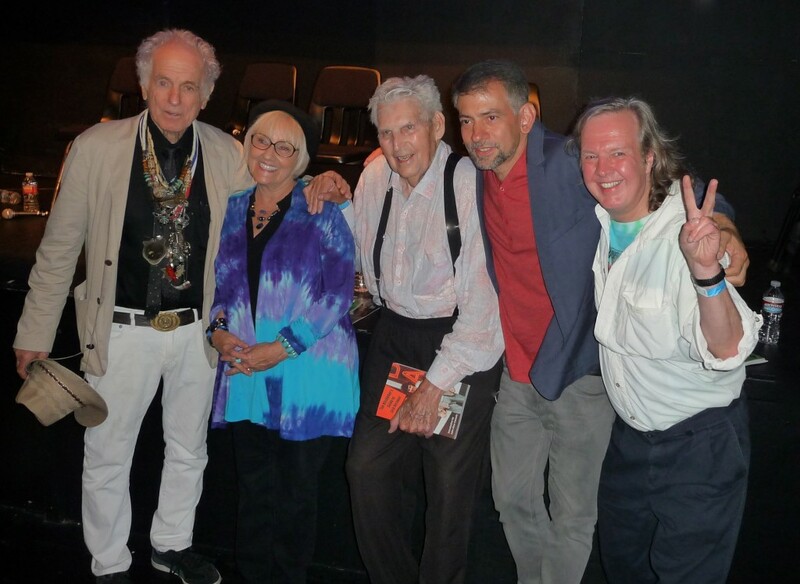 . .
Or here’s a similar video tribute to the late great Carolyn Cassady . . .
Here’s a story about The Beat Museum’s big Beat Shindig where Al makes a couple of appearances back in 2015. Here’s my tribute to his and my close friend Carolyn Cassady when she passed. Here’s some riffs on my book that Al loved — The Hitchhiker’s Guide to Jack Kerouac. This is a beautiful poem. We’re so touched you wrote it. Just great – thank you! Your poem was a nice touch for the memorial event! I got to watch your YouTube tribute in its entirety this evening. Wondrous & Fantabulous! 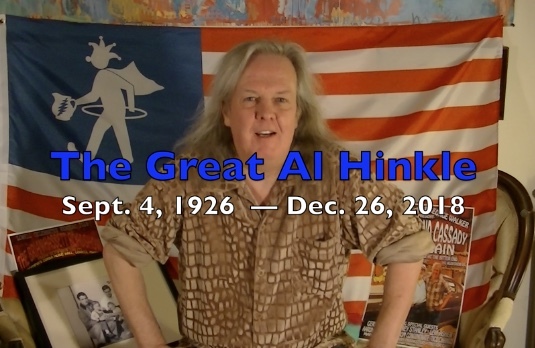 An exceptional tribute to Al Hinkle! Brian, you are so important in your dedication of keeping the Beats alive and relevant in this day & time. Actually, in the eternal moment of now! And the extraordinary way to show the weaving together of the Beat’s to the music that evolved! Deep gratitude and respect dear brother! Just finished reading Hitchhiker’s Guide to Jack! A great and wonderful, informative and important documentation of that phenomenal event! You brought me there. The whole “non-memorial memorial wake” evening was very memorable. Al will be missed and people spoke from their hearts. Stories were told, emotions were expressed, it was a perfect send off for a man in the shadow of the Beats. But in actuality he was right there in the middle of everything right from the start! Maybe even before! Wonder what Al & the Beats are doing on that astro plane in another dimension, the possibilities are endless. I liked the video of your poem. Loved the part about how we could all be the 3rd guy in the car thru Al. Thanks. Great poem, Brian! A fitting tribute. I quite enjoyed this poem for Al Hinkle (and read by Jerry Cimino). Your point about Al being the everyman to sub for you or me or anyone “in the car, man” was a good one. Keep up the good work and the spreading of the holy word . . . .